There's some great bargains on offer in the January sale at Joke and if you'll be needing to buy a fancy dress costume in the near future anyway, a little forward planning could save you a packet. 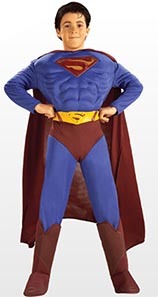 There's plenty to choose from including this Child Superman Muscle Costume which has been reduced in price from £21.99 to just £10.95. This great quality outfit includes a blue and burgundy muscle chest jumpsuit with a long burgundy cape. There's also a moulded belt and fabric boot tops which are attached to this cleverly designed jumpsuit. It would be perfect for any little boy who wants to transform himself from Clark Kent to a superhero.